Less than RM200,000 turnover per year. Less than 10 employees in size. More other terms & conditions here. 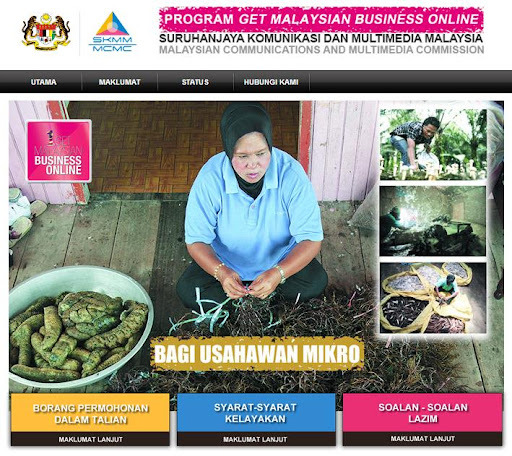 After making a Google search, I found that it is actually the Get Malaysian Business Online Program by Suruhanjaya Komunikasi Dan Multimedia Malaysia (SKMM). I've briefly gone through the conditions and they don't seem to be very difficult to be met. If you're small business owner and always think of putting your business on the web, perhaps this is a great chance for you to be financially aided for a little. To apply now, click here. Is having a website enough to make a difference? Do not know how to optimize your website for search engine discovery. Namely, you do not know how to perform Search Engine Optimization (SEO) for your website to be searchable by your potential customers. Do not know how to promote your products and services through social media like Facebook and Google+. You need to know how to gain followers through those major social networks like Twitter, Facebook, and Google+ so that when you share your website in your network, your followers will aware of it. If they like your products and services, they might reshare your web pages with their friends in their network. This will in turn help to boost the search engine performance of your website on Google, Bing, and Yahoo. If you're a PSMB certified training provider, you can learn more about our Internet Marketing services and find out how we can assist you. We wish you a great success on your website grant application! Hope to see your business online!